Born in Scotland, Allan Pinkerton arrived in America with a solitary silver dollar in his pocket and--as legend has it--the law hot on his heels. A cooper by trade, he might have spent his life making barrels but for a fateful trip in the summer of 1846. On an uninhabited island, where he had gone to cut saplings for barrel staves, Pinkerton happened upon a thicket where a blackened patch suggested a recent fire. To Pinkerton, it also suggested something was amiss. In what became his very first case, the young cooper employed his acute powers of deductive reasoning, patience, and perseverance that would become the hallmarks of his modus operandi. His dogged determination (and several damp, cold, lonely nocturnal vigils) paid off when a gang of counterfeiters was discovered. The modern detective was born. A man of firm beliefs and principles, Allan Pinkerton could be a fair-minded employer--and an absolute tyrant as a husband and father. 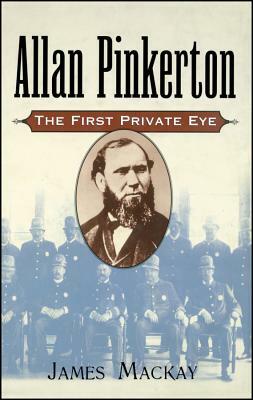 As intriguing as any of the detective's countless cases, Allan Pinkerton: The First Private Eye is a masterful look at an extraordinary figure, filled with the rich, revealing details that distinguish the best biographies. "James Mackay, the award-winning biographer of Robert Burns, is the first historian to attempt to shade in both the darker and lighter sides of Pinkerton, and the result is the tightest and most reliable account so far, a portrait of a man at once deeply admirable and quite obnoxious." --The Times (London). "A fair-minded and thorough analysis of a complex and contradictory man . . . an impressive look at the life of Pinkerton." --The Daily Telegraph (London).